FRAME: Made of Mild steel plates and Fabricated properly. Bearing surface is hand scrapped. CRANK SHAFT: Made of special steel stock to withstand the effective load, properly machined, and fitted in bushes with high accuracy. RAM SLIDE: Made of cast Iron with high grade quality, properly seasoned after rough machining. Bearing surfaces are hand scrapped, with reamed hole for die clamping. FLY WHEEL: Made of high grade Cast Iron and is designed to generate the required energy. BRAKE: The Brake is powerful and works on the top dead centre and compensated by springs. STROKE: Presses are manufactured with adjustable stroke and adjustments can be made by means of a worm. CLUTCH: The Clutch is very rigid, better supported and less liable to suffer damage under heavy operating conditions. The Clutch gives continuous stroke for mass production. 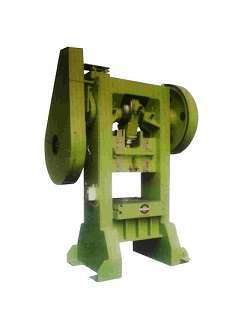 ROLLING KEY: The key is "double key rolling type" made out of special alloy steel of EN series. LUBRICATION: An efficient lubrication system can be provided to lubricate the sliding surfaces and moving parts at extra cost. KEY SYSTEM: These can be provided especially for the use of springs dies against extra cost.